The 2013 Stand Up World Series continues this weekend with the “AC Open” in San Francisco, which is part of the America’s Cup festivities. Some big names are in town, including Connor Baxter, Kai Lenny, Eric Terrien, Annabel Anderson, Kody Kerbox, Ryan Helm and Mo Freitas. Saturday sees the long distance race while Sunday is the sprints. UPDATE DAY ONE: In Saturday’s distance race it was Connor Baxter taking the win yet again, however it wasn’t without a fight. Kai Lenny took the lead early on and held it for most of the race, at one point opening up a 16 second gap on his main rival. 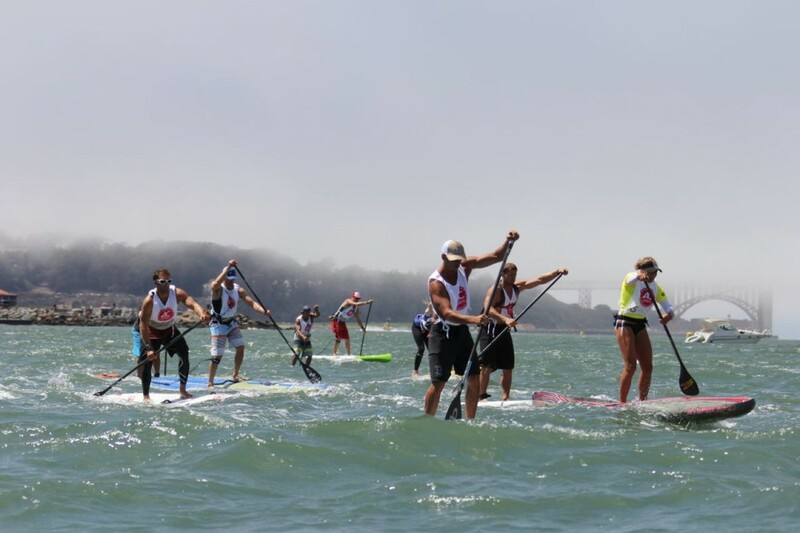 Mo Freitas and Connor were battling for second and it looked like Kai would take the win, but on the final upwind portion of the 6.5 mile course Connor dug deep to pass Kai and keep his winning streak alive. UPDATE DAY TWO: On Day Two it was the knockout sprint racing and again it was Annabel who took the win, though the Kiwi didn’t have it all her own way… The women’s format saw three rounds, with all three results counting towards final placings. Jenny Kalmbach took out the first round with Annabel 2nd, while in the next round the results were reversed. This brought the result down to the third and final round. Annabel got the start but there was some drama on the second buoy, as both the leading ladies fell allowing Halie Harrison into the lead. Though by the end of the course order was restored and Annabel took the final round win with Jenny second, which was also the final overall result. In the men’s it was a stacked final but again came down to the two favourites from Maui. Kai took the early lead and looked in command of the race, while Connor was caught in the pack around the first couple of buoys. Despite Connor quickly making up ground it was Kai all the way to the line. That put the two young guns tied on points overall and into a tie-breaker sprint-off for the AC Open title. It was neck-and-neck in the sprint-off with Connor narrowly hitting the first and only turning buoy in the lead. In the home stretch it was all Connor though, with the Starboard champ pulling away to take the tie-breaker win as well as the overall 2013 AC Open title. An impressive performance also came from Zane Schweitzer, who took a strong third in the sprints after his fourth in the distance race. Those two results were enough to give Zane third place overall, just ahead of Mo Freitas. The event has literally *just* finished, so check out the results below and scroll down for photos and videos of the action from San Fran. Great media coverage and some very cool scenery with the mighty America’s Cup boats being used as props on the course.